First and last month’s rent. Security deposit. Some people simply cannot afford to pay those expenses in advance of moving into a rental home. So instead of signing a lease, they remain homeless. Building Changes believes move-in expenses never should be the factor that prevents people from transitioning out of homelessness. As a result, we have launched a new centralized fund in King County that provides financial assistance to people so they can get past the obstacle of paying those one-time, upfront expenses. The project represents a big step forward for King County because it expands the use of Diversion, which we have found to be an effective and cost-efficient approach for getting people housed quickly, safely, and simply. Learn more. SB 5324 passed the Senate with strong bipartisan support and is now going through the House. It is off to a great start as it was unanimously passed out of the House Education Committee this week, with several legislators powerfully voicing their support. HSSP is funded in the House Budget proposal for $4M, but we are requesting an additional $290,000 for program implementation and additional partnerships. This addition was not included in the House Budget proposal, but we are hoping it will be included in the Senate Budget proposal. Homeless liaisons, students, and advocates from across the state have been championing HSSP through personal testimony and letters of support. 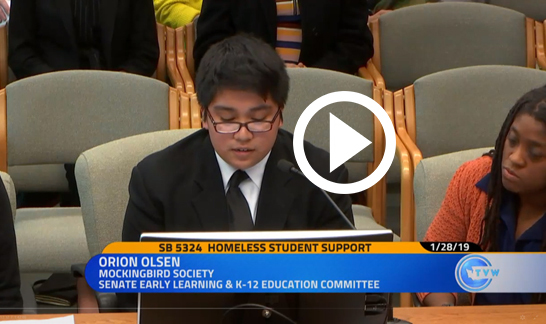 Orion Olson, an advocate with The Mockingbird Society who experienced homelessness in high school, offered powerful testimony about how HSSP ensured that his school had the tools and resources to help him graduate. WYFF is funded in the House Budget proposal for $4M. The Senate Budget proposal is expected any day now and we are hopeful that this proposal will also include $4M in funding. Many of Building Changes’ support items are also doing well, including bills on early learning; youth representation in the Department of Children Youth & Families; homeless youth services under the Office of Homeless Youth; tenant protections and eviction reform; and Temporary Assistance for Needy Families (TANF). Please join us for an eye-opening, interactive exploration of solutions to family and student homelessness! 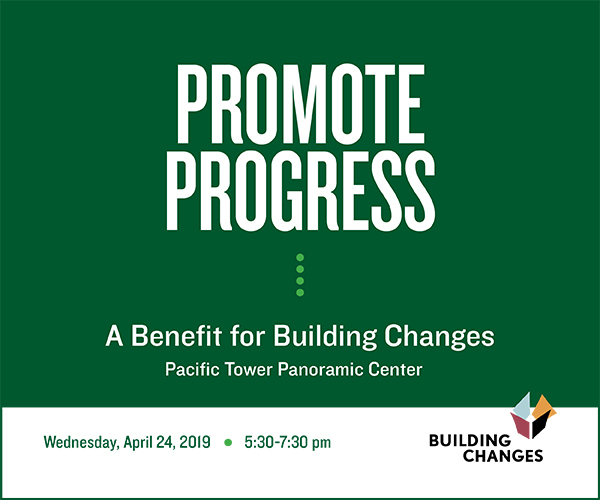 This event is free to attend, and we hope you will consider making a tax-deductible gift of $75 or more to support Building Changes. Our goal: raise $50,000 to ensure families and youth in our state are stably housed. REGISTER NOW. Do you have personal insight into homelessness or housing insecurity that you would like to share? Stories and storytellers are needed for an event called Stories About Home, which will be held on June 6, 2019 at Seattle University. The format will be similar last year's Ignite Project Homeless storytelling event. Story pitches welcome from people of all ages, employment, and educational backgrounds. Pitch deadline: April 22 at 11:59 pm. Stories About Home is a collaboration of The Seattle Times' Project Homeless, Seattle University Project on Family Homelessness, and Seattle Public Library. Learn more. 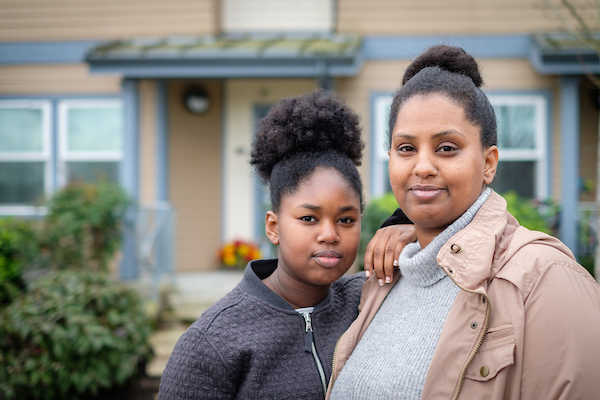 As one of six states to receive funding through Education Leads Home’s State Partnerships on Student Homelessness Project, Washington will explore early learning as a potential new pathway for solutions to homelessness. While Washington looks to replicate an approach in Tennessee that is helping to reduce homelessness among young people aging out of foster care, a new report shows that state-funded inpatient treatment may be another major youth homelessness pipeline. Washington’s regressive tax system makes it the worst state for people with the lowest income. A study of “serial” eviction filings in Atlanta uncovers evidence that eviction proceedings can be predatory and reveals other striking parallels between the eviction crisis and subprime mortgage crisis. Groundbreaking report calls for dismantling institutional barriers across agencies and systems in order to eliminate the racial disparities and systemic racism affecting Black people experiencing homelessness. Illuminating case study demonstrates how and why philanthropy should make greater investments in organizations led by the communities most affected by injustice. A recent TV news special on homelessness in Seattle spurs strong reactions, including an op-ed that calls out the program for being a “drastic, distorted and divisive step backwards” and a column that decries the “dangerous and growing dysfunction” in the way we view and talk about our region’s homelessness crisis. Robert Champagne, who is depicted in the program as proof that "Seattle Is Dying," tells his story and sets the record straight.